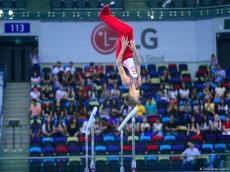 The qualifying gymnastics competitions for the Buenos Aires 2018 Youth Olympics, to be held in Argentina in October, are underway in the National Gymnastics Arena in Baku June 23. Thus, 52 boys and 44 girls from 32 countries are taking part in the qualifying competitions. The first rotation of athletes has already completed. There are two more rotations ahead, after which it will be known who will be able to participate in the competitions in Buenos Aires. Azerbaijan is represented by Samira Gahramanova, Agamurad Gahramanov and Samad Mammadli. According to the results in the all-around qualifying competitions, the athletes who ranked in the first 17 places will be able to participate in the competitions in Buenos Aires, one boy and girl per each country.